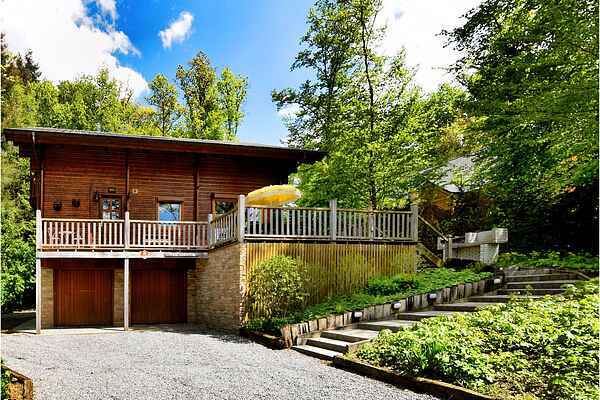 This beautiful chalet is in a residential park at 8 km from the smallest town in the world, Durbuy. It is located in a beautiful area with hills, woods and meadows. The chalet has a charming, warm atmosphere, partly because of the cosy wood-burning stove. All rooms have direct access to the patios or the balcony. In the summer you will find plenty of shady spots around the house and you can relax on the patio. The garden is partially fenced and has a barbecue (cannot to be used in the winter). On colder days it is nice to sit back and relax in the sauna. The chalet is situated in the peaceful surroundings of the Ourthe valley where you can hike or mountain bike. Nearby (1.5 km) you can rent kayaks and mountain bikes. Golf lovers can enjoy themselves on the Durbuy golf course five kilometres away. The caves of Hotton are 17 kilometres away and the caves of Remouchamps 20 kilometres. If you arrive in the winter you can enjoy skiing or cross country skiing about 25 kilometres from the chalet. Important information: Our holiday homes are furnished for receiving families. Other groups only on request! For bookings with youths and larger groups, the home owner will request a double deposit.